Sanbona Wildlife Reserve is home to indigenous wildlife that has been re-introduced, including the Big 5 (albeit in small numbers), cheetah and hippo. Although guests have good chances of seeing elephant, rhino and lion, it is the smaller creatures, plants and rocks that make this reserve truly unique. The flowering season during August and September is spectacular. The area is also rich in fossil and San painting sites. 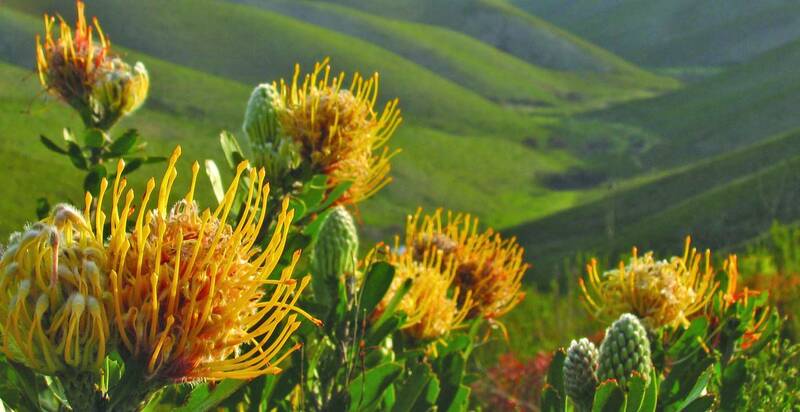 The Gondwana Game Reserve is a spectacular 11 000 hectare property hosting some splendid tracts of pristine and endemic Fynbos. The reserve is a sanctuary for rare and unusual creatures such as the locally endemic Cape to the endangered Black Rhino. Lion and elephants are often encountered whilst out on game drive and the terrain is fairly open. Shamwari covers an impressive 25 000 hectares in the malaria free Eastern Cape and has set the benchmark for conservation and restoring previous farmland to plains abundant with game. Game viewing on the reserve is arguably the best in the Eastern Cape. The blend of valley bushveld, savannah grassland, fynbos, riverine areas and acacia woodland cater for high densities of game. The Bushman’s river meanders through the reserve adding a great refuge for bird species such as kingfishers, darters, finfoots and the iconic African Fish Eagle. Samara Game Reserve hosts a wide array of habitat types. Game drives are conducted in a 14 000 hectare section of the property where rhino, buffalo and cheetah roam whilst nature walks and hiking can be done. The true beauty of Samara lies in the continually changing vistas. Herds of black wildebeest, blesbok and eland roam the plains. A highlight of any trip to Samara is the late night safari where guests search for unusual nocturnal creatures such as aardvark, spring hare and black footed cat. The Amakhala Game Reserve is well stocked with general game and is an excellent place to view cheetah. All the Big 5 occur here. The Amakhala reserve supports a number of different habitat types and ecosystems from coastal dune vegetation to open grass lands and savannah. The reserve also hosts a small population of the rare Black Rhino and sightings of these special creatures are common. There is also another separate section of the reserve populated with only non-dangerous game and it is here that guests will take a guided bush walk if they wish. Garden Route National Park encompasses a mosaic of ecosystems ranging from rain forest to superb coastline. Although not a major safari region, the area hosts several smaller reserves and wildlife sanctuaries where one can get close and personal to African wildlife. A small population of secretive elephants still reside in the forests surrounding the town of Knysna and although seldom seen are testimony to what these vast forests can hide. A myriad trails for hikers and mountain bikers, world class beaches, fabulous restaurants, a range of accommodation options and a plethora of activities can be experienced!